Cannot be applied to any type of moist nail bed. only replacement covered in first 24 hrs cost of product only. No more surgery for your ingrown toe nails, unique European non invasive procedure to relieve your pain and get you back in the game. The revolutionary B/S Brace System provides a NON- Surgical, corrective procedure that will not only eventually eliminate the pain but also help correct the curvature of the nail. Alleviate pain and discomfort associated with curve and involuted toe nails. Eliminates or reduces excessive pressure at the lateral nail edges. Helps correct the curvature of the nail. Is simple, fast and painless and involves NO surgery and NO downtime. Is almost invisible, since polish can be applied over the top of the brace. Produces noticeable, pain-relieving results in just days. 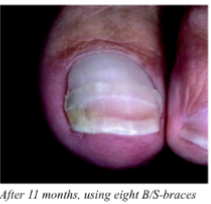 The B/S Brace procedure will put an end to toenail pain. Immediate relief right after application. Depending on the clients issues, more than one application maybe required. 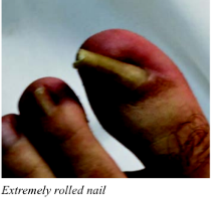 The band grows with the toenail, which can mean possibly 1-4 applications before the issue is resolved 100%. FOOTLOGIX products are also used for mini pedicures (required prior to B/S system) for best results.